Ohio State’s Comprehensive Spine Center offers multiple options for the treatment of cervical spinal stenosis. Your spine, or backbone, protects your spinal cord and nerves, and allows you to stand and bend. Cervical spinal stenosis is the narrowing in your upper spine due to wear and tear. The narrowing in the neck area puts pressure on your nerves and spinal cord and can cause pain and disability. Cervical spinal stenosis can lead to myelopathy, damage resulting from the spinal cord being compressed due to narrowing of ligaments, bones and discs surrounding the spinal cord. Doctors diagnose cervical spinal stenosis and myelopathy with a careful history, physical and neurological exams, and imaging tests. Treatments include medication, physical therapy and surgery. Why choose Ohio State for treatment of cervical spinal stenosis and myelopathy? Comprehensive Care: The Ohio State University Wexner Medical Center’s Comprehensive Spine Center offers multiple options for the treatment of cervical spinal stenosis. For most patients, surgery is not necessary. But if your quality of life is compromised, our spine surgeons can address the most challenging surgical cases, assisting those who cannot find help elsewhere. Multidisciplinary Team: When you come to Ohio State’s Comprehensive Spine Center, we determine the source of your pain, diagnose the severity of your condition and choose the best, least-invasive treatment approach to restore you to the highest level of function possible. Physical Therapy Expertise: If you have mild cervical spinal stenosis, our physical therapists, who specialize in spinal conditions, work with you one-on-one to alleviate back pain and improve balance, strength and coordination. Surgical Expertise: If your stenosis has progressed and requires surgery to protect your spinal cord, we have spine surgeons who are fellowship-trained in complex spine surgeries. We perform more complex spine surgeries than any other medical center in central Ohio. Research: You will benefit from our involvement in national and international trials that provide you with the most current treatment methods for cervical spinal stenosis and myelopathy. 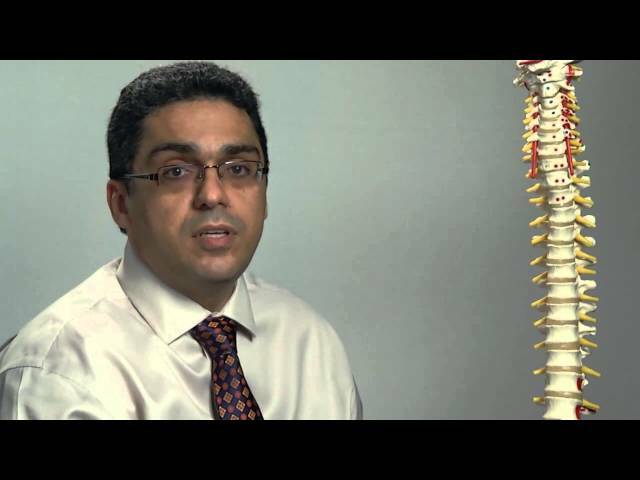 Dr. Francis Farhadi explains the diagnosis of spinal stenosis and the treatment options that are available at our Comprehensive Spine Center. As part of your thorough history and physical exam, we use the Modified Japanese Orthopaedic Association scale – an international standard – to assess the severity of your spinal cord damage. The scale measures extremity numbness, weakness and coordination problems, bladder and bowel problems, fine motor skills of the hands, and balance issues. We routinely use magnetic resonance imaging (MRI) of the cervical spine to give us high-resolution pictures of the spinal cord and surrounding tissues. Ohio State offers treatments ranging from physical therapy to the most complex neck and spine surgeries. Our physicians, therapists and other caregivers provide you with options that increase mobility and reduce pain. Most people who come to the Comprehensive Spine Center do not require surgery. One of Ohio State’s strengths is our physical therapy program, with therapists who specialize in complex, degenerative spine conditions. Following a thorough examination of posture, neck mobility, strength and flexibility, our physical therapists customize a plan for you. We take into account any impairments or functional limitations you have. Typically, you will work one-on-one with a therapist on pain-relieving movement strategies and on improvements in balance, strength and flexibility. Acupuncture (provided at the Comprehensive Spine Center) or dry needling for pain control through Ohio State’s Center for Integrative Medicine. You may need surgery if you have moderate to severe cervical spinal stenosis with myelopathy. Surgery can prevent further spinal cord damage and perhaps allow the spinal cord to recover over time, with the aid of physical therapy. Decompression surgery, which can be performed from the front or back of the neck. Laminectomy is performed from back of the neck, removes part of the vertebra (neck bone) and relieves pressure on your spinal cord. Our surgeon may use metallic plates and screws to prevent slippage of one vertebra over another. Spinal cord decompression from the front is performed by removing bone and a disc or discs and fusing vertebrae. Spinal fusion surgery is sometimes used in the laminectomy procedure to fuse vertebrae and restore stability to the spinal column; for cord decompression from the front, spinal fusion and using metallic plates and screws are always part of the procedure.